BANGKOK, April 25 – The Thai-Cambodian border clashes during the past four days have caused approximately Bt300-500 million (US$10-17 million) in losses in border trade and tourism, Thanawat Palavichai, director of the Economic and Business Forecast Centre at the University of Thai Chamber of Commerce (UTCC), said on Monday. The fighting, which erupted in Surin province on April 22, has mainly affected trade and tourism along the borders of Si Sa Ket and Surin with Cambodia. The effects, expected to be short-lived, have caused an estimated Bt50-100 million ($1.7-3.3 million) in daily losses. However, the continued border skirmishes have not hurt the Thai economy overall, Mr Thanawat explained. Thai-Cambodian border trade is valued at some Bt60 billion (about $2 billion) annually. Most border trade is conducted across the borders of Sa Kaeo and Trat, where about Bt40 billion (over $1.3 billion) changes hands annually, while trade and tourism in Surin and Si Sa Ket earned much less, at an estimated Bt2.4 billion ($80 million) in annual revenue. Although economic activities along the border in Trat and Sa Kaeo continue as usual, Mr Thanawat ventured that the fresh border clashes may cause a psychological impact on people of the two countries due to worries about the situation. Meanwhile, Thai and international tourists are likely to postpone or redirect their trips to Angkor Wat in Siem Riep, Cambodia’s main tourist attraction. If the border tension escalates and the border crossings in Surin, Sa Si Ket, Sa Kaeo and Trat are closed, around Bt100-200 million ($3.3-6.6 million) will be lost daily, with overall losses of Bt1 billion ($33 million), the UTCC academic predicted. 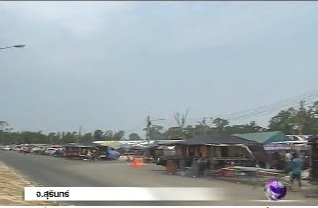 Meanwhile, the Surin Chamber of Commerce said that the border clashes resulted in closure of the Chong Jom border crossing which caused a Bt15-20 million ($500,000- 670,000) daily loss and called for the governments of the two countries to end the violence soon.